The morning sunlight illuminated the beautiful pea green sea. The sea invigorating and clear made the fisherman feel alive and free. It was going to be another profitable day and hearts were glad. None of them realised that in a few short hours things were going to get really bad. The Master accompanied them on their expedition today. The golden rays crowning the sea made a lovely bouquet. No change in the weather was even thought about or even noticed. Jesus feeling very tired decided to go below and have a rest. The sky turned black and the winds bellowed they’re wildest. The fishermen’s hearts failed and they were filled with a deep fear. They were afraid and thought death was increasingly near. Jesus could see and feel their complete anguish. 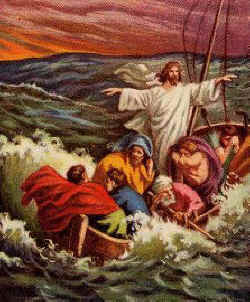 Calmly he raised his hand and masterfully rebuked the sea. The fishermen and disciples in total awe got down on bended knee. Who is this that commands the sea and the waves? He spoke with authority that the elements were his slaves. The roaring wind and tumultuous sea did instantly cease. The sea was calm, the sun was shining and all was at peace.